2 piece set of left and right lower slingshot bumper plastics for Williams Getaway pinball. New reproduction parts. 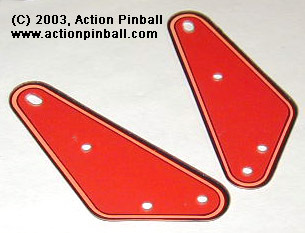 These are the lower plastics for both left and right bumpers that mount on the playfield posts. Top plastics (with gauges) that mount above these are not included.